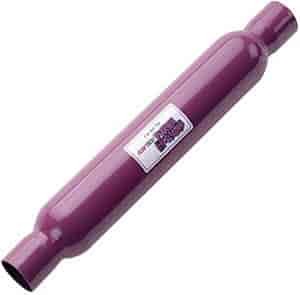 Dynomax 24201 - Magnum Glasspack Muffler In/Out: 2.25"
50225 - FlowTech Purple Hornies Header Muffler is rated 4.0 out of 5 by 3. Rated 5 out of 5 by Stacey from Great sound! Bought these because of the price. Git them put and couldn't be happier. The sound is even better than I thought. Rated 5 out of 5 by Big Dawg King from Purple Hornies Glass pack I bought this muffler to replace my factory resonator on my 2012 Dodge Avenger V6. This is a good quality mufiler. It's not a true slipfit. I had it welded for maximum performance. You can't beat the price! Rated 2 out of 5 by MoparManDan from Sounded nice till it blew Put this exhaust on my 2003 jeep grand cherokee 6 cyl 4L. Sounded sweet with a deep throaty sound in first and second gear, by third it had a sound of a Silverado even the idle sounded nice. Was super happy until I took a 5 hour trip and the muffler blew. Now it sounds like a ricer and can be heard from a mile to a mile and a half away (not over exaggerating at all). I'd give it another chance on my classic cars but not my daily driver. JEGS 30801 - Sure Seal 2-1/4" Clamp Fits 2.330" to 2.530"